In today's fast paced world, social media sites have not only staked their claim but removed many of the borders that formerly existed in the communication landscape. (YAWN! Sorry, that's my more formal version...but you guys get the fun and exciting stuff!) Whether you're a Twitter newbie or a seasoned pro (I'll take salt and pepper, please! Just kidding...), "The Twitter Book" has something for you. to send a tweet via SMS, after your phone number is registered, send to 40404 (US only, although I believe there is one for international users too)? to send a Direct Message from the main screen, simply type "d" then the user name without the @? to see if someone is "following" you, DoesFollow offers a simple fill-in-the-blank page to check by user name? Both authors have a Twitter page! (Go figure, right?) 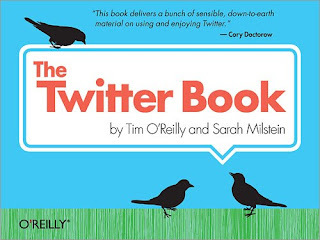 Check out @timoreilly and @sarahm, or the additional account listed as @TweetReport for additional tips and insights. What Twitter applications or related sites do you use and would recommend to others? Why? A purple dress and yellow shoes? Nothing wrong with that, at least the shoes matched (or did they?) I'm not on Twitter (FaceBook? Yes)but love the little blue bird icon - I wish FaceBook had something as cute as this. I love Twitter, you know this. I've yet to read a book on it, I think it's so user friendly and fun, that I don't need to. Have you seen that book "The World According to Twitter"? That thing is hilarious. Petty Witter: Yes, the day decided to make a fashion statement. =0) I myself have never tried Facebook or MySpace...Twitter was my first! Bri Meets Books: It is user friendly but its amazing how much more you can do with it. This book highlighted some of that.